PROSFast. Automatic document feeder. Touch-screen controls. Ethernet and Wi-Fi. Wi-Fi Direct. CONSNo duplexer. Only 250-sheet input capacity with no optional trays available. BOTTOM LINEThe CLX-4195FW color laser MFP offers fast speed, reasonably good output quality, and suitable paper capacity for light to moderate-duty printing in a micro or small office. BY M. DAVID STONEThe Samsung CLX-4195FW ($450 street) delivers most of the basics you’re probably looking for in a color laser MFP, from fast speed to a full set of MFP features. That alone is enough to make it a potentially good fit for a micro or small office with light to medium-duty print needs. However, it goes beyond the basics with extras that include a color touch-screen control panel and Wi-Fi Direct, which makes it easy to connect from a smart phone, tablet, or laptop. If you can make use of these extras, it can be an even better fit. As with the HP LaserJet Pro CM1415fnw color MFP $359.99 at TigerDirect.com, which also offers a color touch-screen control panel, the CLX-4195FW backs up the touch screen with a well-designed menu system. If you rarely give commands from the front panel, you may not consider this an important feature, but the more you use it, the more you’ll appreciate it. Having a 4.3-inch screen to work with not only makes it easier to choose menu options for copying, faxing, and the like, it also makes it easier to change printer settings and even set up features like Wi-Fi Direct. Once you’ve used it awhile, in fact, you may find that conventional controls—with buttons and a small text-only LCD—seem painfully limited. Extras like a touch screen are nice to have, but they wouldn’t matter much without a foundation of solid basics. In addition to being able to print and fax from, as well as scan to, a computer using commands from the computer, the CLX-4195FW can also scan to a computer and scan to or print from a USB key using front-panel menu commands, and it can work as a standalone copier and fax machine. It can also work as a direct email sender, although it won’t work with email servers that require SSL, which means it may not work with the email system you use. Other key features include a 50-page automatic document feeder (ADF) for scanning multipage documents as well as legal-size pages, and both Ethernet and standard Wi-Fi support in addition to Wi-Fi Direct. Paper handling, unfortunately, is not a strong point. The single tray offers only a 250-sheet capacity. Although that should be enough for most micro and small offices, there’s no option to add more if you need it, which pretty much limits the printer to medium-duty use at most. Also notable for its absence is a duplexer (for two-sided printing), even as an option. One small extra for paper handling is an unusual single-sheet feed mounted on top of the paper tray itself. It’s a little awkward to use, since you have to pull the tray out, insert the single sheet in the feeder, and then put the tray back in. On the other hand, it’s an improvement over having to swap out all the paper in the tray to print a single envelope or odd-size sheet of paper. So although it’s not as useful as having a separate manual feed tray, it’s better than nothing at all. The SCX-4195FW is a little large to share a desk with, at 17.6 by 16.5 by 16.8 inches (HWD), and it is heavy enough, at 47.3 pounds, that you’ll probably want some help moving it into place. Once you find a spot for it, however, setup is standard fare. For my tests I connected it to a wired network, and installed the driver on a Windows Vista system. The printer’s speed counts as a strong point. I timed it on our business applications suite (using QualityLogic’s hardware and software for timing) at 6.0 pages per minute (ppm), which is a suitable speed on our tests for the 19 ppm rating for both color and monochrome. That makes it a tad slower than the less expensive Ricoh Aficio SP C240SF$399.00 at ElectronicsShowplace, at 6.3 ppm, but essentially tied with the more expensive Editors’ Choice Dell 2155cn $429.99 at Dell. It’s also faster than most other printers in its price range, including, in particular, the HP LaserJet Pro CM1415fnw, at 2.9 ppm. The printer also holds up reasonably well on output quality. It doesn’t stand out from the competition on this score, but it is par for a color laser MFP across the board, which is reasonably high quality by any definition. Text in our tests was easily good enough for any business need short of top-quality desktop publishing. Graphics output, similarly, was more than good enough for any internal business need, including PowerPoint handouts or the like. Depending on your level of perfectionism, you might consider it good enough to hand out to important clients or customers when you need the output to convey a sense of professionalism. Photos were near the high end of the range for color laser MFPs, which makes them close to true photo quality. The one potential shortcoming for this printer is its paper handing. If you need automatic duplexing, a higher paper capacity, or at least a real manual feed tray, you’ll have to look elsewhere. If the paper handling is good enough for your needs, however, the Samsung CLX-4195FW’s balance of speed, output quality, and MFP features, along with the convenience of touch screen menus, makes it a more than attractive choice. What it lacks in speed, the $250 Brother HL-5470DW monochrome laser printer makes up for in good-quality output and cheap toner. In fact, in terms of price per page, the HL-5470DW is one of the cheapest-to-operate printers on the market—inkjet or laser, consumer or corporate—when you use the high-capacity cartridges. Installing the HL-5470DW is easy, but you’ll need to use USB or ethernet for the Wi-Fi installation process if you don’t have a WPS router (a small complaint). The software is excellent; Brother has even managed to automate the Add Printer function in OS X, something that most printer vendors are seemingly clueless about. The fact that Brother treats Apple right is rather interesting, as the HL-5470DW’s clunky controls reside on the other end of the design spectrum. The single-line monochrome LCD and the minimal number of buttons, while fine for error messages and the like, imposes limitations. Entering a passcode for secure print jobs is tedious at best and will probably have most users sticking with simple four-digit number sequences (like 0011 or 1012) that don’t require a lot of scrolling. Once you’re used to the interface, it’s workable, but a keypad might be in order to make the secure print feature, well, more secure. The HL-5470DW automatically duplexes (prints on both sides of the page). You’ll find a 250-sheet bottom-mounted input tray, as well as a 50-sheet multipurpose tray (for envelopes, heavy stock, and the like) that folds down in the front. If that’s not enough, you can purchase an optional bottom-mounted, 500-sheet auxiliary tray for $210 from Brother’s online mall, though we saw lower prices at other sources. If you need even more capacity, the nearly identical HL-6180DW maxes out at 1050 sheets instead of 800. The HL-5470DW comes standard with 128MB of memory; you can upgrade it to 384MB via a SODIMM slot located underneath the unit’s pop-open side panel. While the HL-5470DW is hardly a barn burner, it prints at speeds adequate for a small workgroup or office. Monochrome pages exit at a rate of 14 pages per minute on the PC and 16.7 ppm on the Mac, and 4-by-6-inch photos printed on letter-size paper emerge at a rate of about 2.0 ppm. Automatic duplexing, which always slows down printing, is refreshingly quick on this model. The quality of the HL-5470DW’s output is generally quite nice. In our tests, text was dark and sharp, but we noticed some light striations in larger areas of black. Photos rendered passably, though they seemed a little rough and grainy. The printer’s higher-quality HQ1200 and 1200DPI settings offered only slight improvements. As mentioned up top, toner costs for the HL-5470DW are very good—and if you shop around, they’re outstanding. Using the suggested retail prices, the standard $77, 3000-page TN720 cartridge works out to 2.6 cents per page. Opt instead for the $125, 8000-page TN750, and you’ll pay only 1.6 cents per page. That’s an outstanding cost per page for any printer. 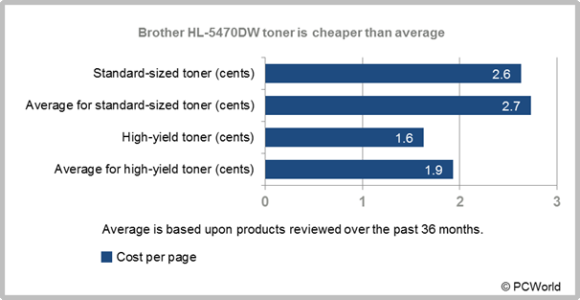 Though it may not be fancy or overly fast, the Brother HL-5470DW has all the connectivity options you’ll need, as well as good-quality output and incredibly affordable toner. It would be nice, however, to see Brother upgrade its control-panel technology and design one of these days. If you’re seeking alternatives, the Samsung ML-3712ND is in the same price range as the HL-5470DW, but its toner is much costlier. One step up in Brother’s mono laser multi-function printer (MFP) line from the Brother MFC-8710DW $369.99 at TriState Camera, that I recently reviewed, the Brother MFC-8910DW shares almost all of the same features and specs. However, there’s one important addition. Instead of being limited to scanning only one side of a page, it can scan both sides at once. Not only can it deal with duplex (two-sided) documents, it can handle them at reasonably fast speed. That alone is enough to make the MFC-8910DW of particular interest to any micro or small office or workgroup that has to scan, copy, or fax multi-page duplex documents. But it also helps that the printer offers all the same capabilities that make the Brother MFC-8710DW an attractive choice for heavy-duty needs. Basic MFP features include the ability to print, scan, and fax, including over a network, as well as work as a standalone copier and fax machine. Conveniences include the ability to print from and scan to a USB memory key, as well as support for Wi-Fi and for a variety of mobile printing options, including AirPrint, Google Cloud Print, and Brother’s own mobile print and scan app. Also loosely in the convenience category is the addition of on-site service to the one-year warranty, a little sweetener that isn’t included with Brother MFC-8710DW. The most important extra, however, is the duplex scanning. As with most MFPs aimed at offices, the MFC-8910DW offers both a flatbed and an automatic document feeder (ADF) for scanning. Unlike most of its competition, however, it can fit legal-size pages on its flatbed, so you don’t need to use the 50-page ADF for one-page legal-size documents. Even more important is that it can scan in duplex, which may be an even better feature than you think. There are two ways to scan both sides of a page. What most inexpensive MFPs offer is often called a reversing ADF. With these MFPs, the ADF is doing the duplexing, scanning one side of a page, turning the page over, and then scanning the other side. With the MFC-8910DW, the scanner does the duplexing, with two scan elements that each scan one side of the page at the same time. The result is much faster scans, with the paper moving through the ADF only once instead of twice. In theory, using two scan elements should let you scan both sides of the page as quickly as one side, which is usually true for most duplexing desktop scanners for example. In my tests with the MFC-8910DW, however, the scanner visibly slowed down when I scanned in duplex. The good news is that the speed was still a lot faster than scanning each side separately. The MFC-8910DW also scores well on paper handling for printing, with a 250-sheet paper drawer, a 50-sheet multipurpose tray, and a built-in print duplexer. That should be enough for most small offices, but if you need more, you can boost the input capacity to 800 sheets with an optional 500-sheet second drawer ($209.99 list). Note too that the combination of a duplexing scanner and duplexing printer gives you the ability to copy both single- and double-sided pages to your choice of single- or double-sided copies. As with the Brother MFC-8710DW and most other MFPs with a similar paper capacity, the MFC-8910DW is a little large to share a desk with comfortably, at 17.6 by 19.3 by 16.3 inches (HWD). However, it’s small enough to fit easily enough in most micro or small offices. Assuming you have room for it, setup is absolutely standard. For my tests, I connected the printer to a wired network and ran the tests from a Windows Vista system. Interestingly, despite all the similarities to the Brother MFC-8710DW, Brother rates the MFC-8910DW at a slighter faster speed, namely 42 pages per minute (ppm) rather than 40 ppm. On our tests, however, the two were essentially tied. I clocked the MFC-8910DW on our business applications suite (usingQualityLogic’s hardware and software for timing), at 10.0 ppm. The Brother MFC-8710DW actually came in a touch faster, at 10.5 ppm, which isn’t enough of a difference to count as significant. As another point of reference, the Editors’ Choice OKI MB471 $352.27 at gocomputersupplies managed 9.5 ppm, putting the speed for all three printers in the same range of being respectable, but not particularly impressive. Output quality earns the same general description: respectable, but not impressive, which translates to par quality across the board. Text and graphics output are both easily good enough for any internal business need. However, the text isn’t up to what you’d want for high-quality desktop publishing, and depending on how demanding you are, you may not consider the graphics good enough for, say, PowerPoint handouts when you’re trying to convey a sense of professionalism. Photo quality is suitable for printing photos in company or client newsletters and the like, and easily good enough for printing Web pages with photos. When I reviewed the Brother MFC-8710DW, I pointed out that it was a perfectly good choice, with reasonably good speed, par output quality, ample paper handling, and all the MFP features that most small offices need. The MFC-8910DW offers all the same features, which makes it at least as reasonable a pick for any micro or small office. However, it’s the added ability to scan in duplex that makes it either worth picking or not. Quite simply, if you don’t need a duplex scan capability, there’s no point in paying for it. You should be looking at the Brother MFC-8710DW or the OKI MB471. On the other hand, if you need to scan, copy, or fax duplex documents even occasionally, being able to scan in duplex is worth the extra cost. It also makes a compelling argument for choosing the Brother MFC-8910DW instead. Although nearly identical in most ways to the Brother MFC-8910DW that I recently reviewed, the Brother MFC-8950DW $525.00 at PCNation, offers enough extra to be easily worth the extra cost. The key additions are a higher paper capacity, making it suitable for even heavier-duty printing, and front-panel touch-screen controls, making it easier to give commands from the front panel. Either feature by itself can be well worth having. Together, they make the printer an Editors’ Choice. Clearly aimed at a micro or small office or workgroup with heavy-duty needs, the MFC-8950DW can print, scan, and fax, including over a network. It can also serve as a standalone copier and fax machine, with the touch screen helping to make it unusually easy to use in those roles. Notable conveniences include printing from and scanning to a USB memory key, as well as support for a variety of mobile printing options, including AirPrint, Google Cloud Print, and Brother’s own mobile print and scan app. In addition, it offers Wi-Fi Direct, so you can easily connect to mobile devices. One of the more unusual touches for the MFC-8950DW is far better scan capability than you may expect. As with most MFPs aimed at offices, the MFC-8950DW includes both a flatbed and an automatic document feeder (ADF). Unlike the flatbeds on most small office MFPs, however, the MFC-8950DW’s flatbed is big enough for legal-size pages. You can also scan at legal size with the 50-page ADF, and scan in duplex (both sides of the page). Very much worth mention is that the scanner, rather than the ADF, does the duplexing, meaning it has two scan elements, so it can scan both sides of the page at the same time. Many, if not most, small office MFPs with duplex scanning use duplexing ADFs instead (often called reversing ADFs), which scan one side of the page, turn it over, and then scan the other side. In theory, having two scan elements should let you scan both sides of the page as quickly as one side. In reality with the MFC-8950DW, the scanner visibly slowed down when I scanned in duplex. Even so, the speed was a lot faster than it would be scanning each side separately. Not so incidentally, note that the ability to scan in duplex, combined with print duplexing, also lets you copy both single- and double-sided pages to your choice of single- or double-sided copies. For small offices with heavy-duty print needs, the MFC-8950DW also earns lots of points for its paper handling for printing, with a 500-sheet paper drawer, a 50-sheet multipurpose tray, and a built-in print duplexer standard. If you need still heavier-duty printing, you can bring the capacity up to 1,050 sheets with a 500-sheet second drawer option ($209.99 list), although the smarter choice is to get the Brother MFC-8950DWT ($700 street), which according to Brother is the identical printer with the second tray already added. As you would expect for any MFP with this much paper capacity, the MFC-8950DW is too large to share a desk with comfortably. However it’s small enough at 18.8 by 19.3 by 16.3 inches (HWD) that you shouldn’t have any trouble finding room for it in most small offices. Once you have it in place, setup is standard. The MFC-8950DW’s speed is best described as respectably fast, but not impressive. For my tests, I connected the printer to a wired network and ran the tests from a Windows Vista system. Not surprisingly, given all the similarities to the MFC-8910DW, including the same 42 page-per-minute (ppm) engine rating, the two performed similarly on our tests. On our business applications suite, I timed the MFC-8950DW at 10.6 ppm, essentially tying the MFC-8910DW. As another point of reference, the somewhat less expensive Editors’ Choice OKI MB471 $352.27 at gocomputersupplies scored a slightly slower 9.5 ppm. Output quality is par for a mono laser MFP across the board, which makes it acceptable without being impressive. Text and graphics output are easily good enough for any internal business need, but text is a little short of what you’d want for high-quality desktop publishing, and depending on your level of perfectionism, you may not consider the graphics suitable for, say, PowerPoint handouts when you’re trying to convey a sense of professionalism. Photo quality is easily good enough for printing Web pages with photos. Whether you consider it suitable for printing photos in company or client newsletters and the like will depend, once again, on how much of a perfectionist you are. In my MFC-8910DW review, I suggested that its ability to scan in duplex was a primary reason to either choose it if you need duplex scanning or pass on it if you don’t, since there’s no reason to pay extra for the feature if you don’t need it. The same logic applies here to some extent, but the MFC-8950DW has other compelling arguments in its favor as well. In an office with sufficiently heavy-duty print needs, the high paper capacity by itself can make the Brother MFC-8950DW worth getting, and the convenience of touch-panel controls can be particularly attractive if you expect to use the standalone copier and fax features often enough. Also worth mention is the printer’s Gigabit Ethernet, which, depending on network traffic and the rest of your network hardware, could make a difference in the print speeds you’ll actually see. All of these features together make the Brother MFC-8950DW Editors’ Choice for any micro or small office with truly heavy-duty needs. Bay Area’s leader in office equipment sales, service, repair and supplies. © 2016 Computer Extras Express. All rights reserved.